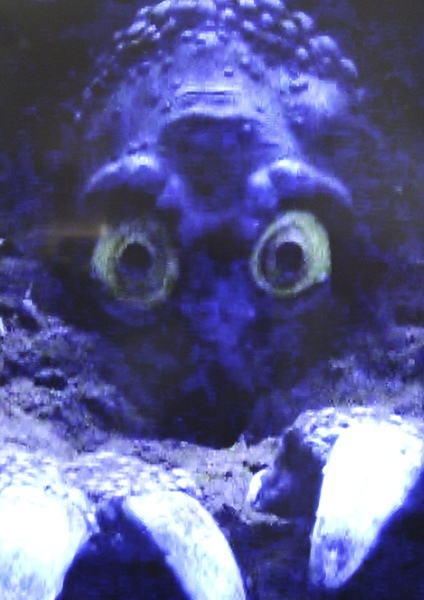 there was no monster movie I wanted to see more desperately. hardly slept a wink afterwards; I was so ecstatic! ... but I vowed to take an alternate approach next time. There was no postponing the inevitable any longer. What a cool monster kid story! I love the associated pictures that go with it. 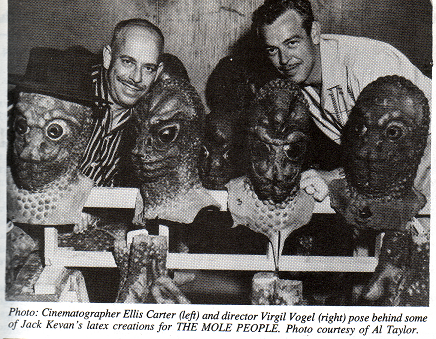 The Mole People is definitely a favorite with me as well. Cool story Huna,it's great that you have the pics to go along with your info. 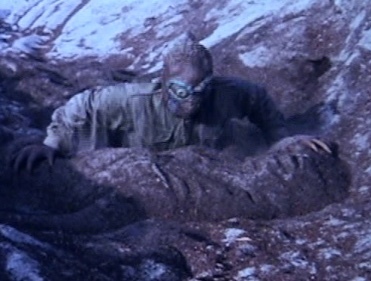 The original effect used ground cork rather than real dirt or sand. The cork is very light weight and easy to push up through. 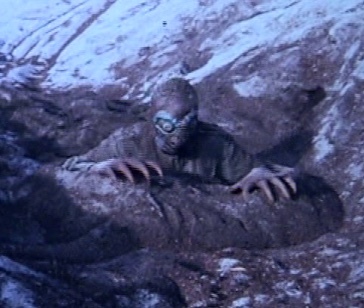 Ground cork was also used for quicksand effects as it would float on top of the water and remain dry. Just bought a MoleMan reissue off of eBay. Do I understand correctly that it was the only mold to survive from the original release in the 60s? Other than a Gorn mask that I inherited from a haunted house in high school (and is long gone), this will be my first DP mask! Another great, informative post from the mighty 'Huna! I too, have a very soft spot in my heart and head for The Mole People. John Agar, Ward Cleaver from Leave It To Beaver, and Alfred the butler from Batman, plus the 1950's greatest scientist, Doctor Frank Baxter? I used to stay up until any o'clock to watch this movie. Yes, love is strange. 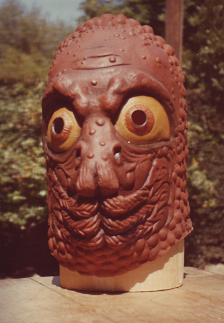 The Mole Man mask was never one of the big sellers at DPS, but it was always fun making them when we'd get an order for a set. Fuzzy flocking fun. 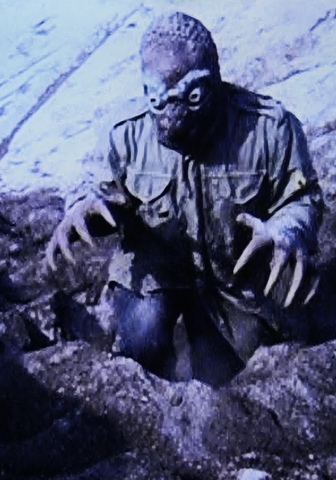 Just before production on the Mole Man, and the other licensed Universal masks ceased, Bob Short changed the paint scheme from flocking, to the Mummy Earth mud paint we used on the Mummy masks. It was interesting, but I missed the fuzz. 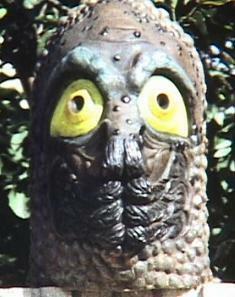 Anyone out there seen one of the Mole Man masks painted like this? We didn't make very many. 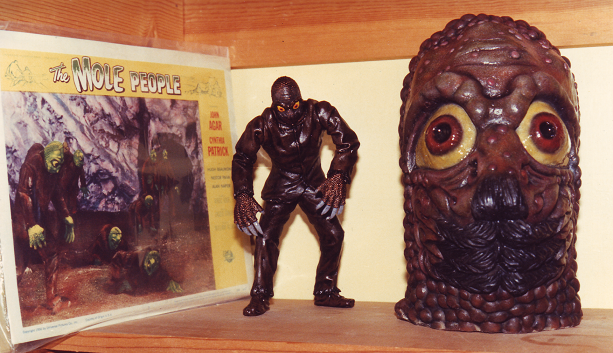 JimPV, the Mole Man was not the only original release DPS mold surviving from the 1960's. In the Calendar Masks reissues from the late 1990's, the Phantom, the Wolfman B, the Karloff Frankenstein, and Mummy B were all produced from Masters made from the original 1960's Master Molds. Very cool info. 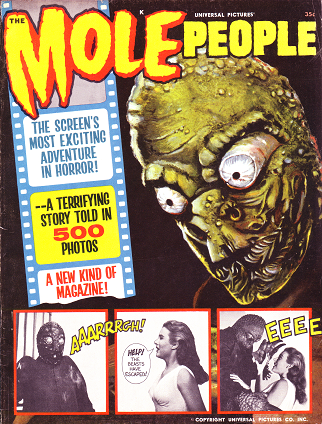 I remember being a kid in the early 70s and examining a Mole Man mask at a local costume shop - I remember specifically being impressed by the fuzzy head bumps!